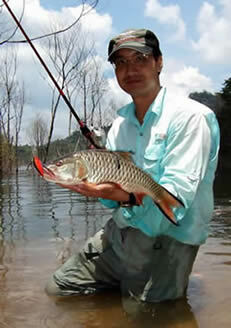 Commonly known as Sebarau (Hampala macrolepidota in scientific lingo or Hampala Barb by IGFA) in Malaysia. It is the hardest lure hitting fish in the freshwaters here. Anglers working a lure are never in doubt when a sebarau has taken their lure! This was the first Sport Fishing Malaysian website. It was started in 1997. Jeff designed and constructed the website, while I provided the content. I have uploaded the original content and website format as it was 20 years ago. Hard to imagine, but yes, we had this resource in the previous millineum for anglers! Enjoy! Anglers or even naturalists wanting to know about this outstanding sportfish can visit here valuable information that sport anglers glean from their experience in searching for this fantastic sportfish. 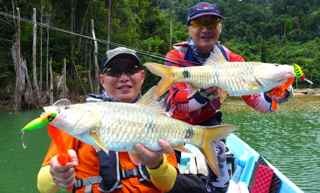 We have also be listed other lure eating fish species common to Malaysia which can be found in the"other species" link. 26th July 2018 - A Hard Time at Bakun Dam Sarawak hunting for sebarau. 25th May 2018 - Active Response Drag Mechanism by Abu Garcia for Revo Toro baitcast reels. View the benefits in this video. 26th December 2017 -Toothy Delights - more on fishing toothy creatures, the narrow-barred spanish mackerel (tenggiri) and barracuda. 10th October 2017 - Fine wire hooks, can we use them for out tropical fish? 25th August 2017 - Take a look at the new Abu Garcia Revo MGX2 and compare it with the previous MGX. 7th August 2017 - Some anglers believe solely in using treble hooks for lures, but do singles work well for hooking toman? Read about it here. 30th June 2017 - Video of fishing the Hampala bimaculata species, endemic to Sarawak (Borneo), Malaysia. Click picture to view video.